This classic collection provides chapter-by-chapter outlines of the whole Bible that are perfect for developing lessons or for devotional reading. Pastors and students still revere Henry's works because of his simple eloquence in expressing profound spiritual truths. 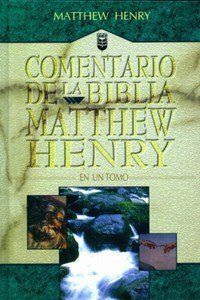 About "Comentario De La Biblia Matthew Henry (Matthew Henry Commentary)"
Matthew Henry (1662-1714), was born into a committed Puritan family and followed his father's footsteps into full-time ministry, being ordained as a Presbyterian pastor in 1687. Despite ill health, deep bereavement, and the demands of his pastoral duties, Henry produced many devotional and scholarly works. They remain popular three centuries after his death, especially his classic commentary on the whole Bible.